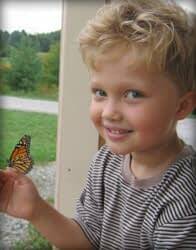 The loss of a child is a road that no parent should have to travel, but on May 9th, 2008, at 6:47pm, Logan, our six year-old son, collapsed in our den and, despite my efforts to revive him, he died instantly in my arms. He was a healthy boy who lived a normal, active life. The autopsy report indicated that his heart was 75% larger than normal. Later we learned the cause of his death was Viral Myocarditis. This was a total shock to all of us. For months, I walked through life in a fog. How would I continue to live? It has been three years since that devastating moment. One of my biggest fears when Logan died was that people would forget him; that his friends and teachers at school would forget how much fun he was, how easily he laughed, and how enthusiastic he was to learn. The school has since honored Logan by naming an award after him. To make sure that Logan would be remembered, I made a large quilt from Logan’s pictures, artwork and his favorite shirts, all sewn together. This beautiful memory quilt sits on our bed right now, a constant hug from Logan. Next, we had a beautiful bench installed at the school playground, dedicated to Logan by his family. It is a place for anyone to sit and be where Logan loved to “Laugh, Play and Love” – the inscription on the bench plaque. Lastly, to keep Logan’s memory alive, we created the Logan Sweet Foundation with the mission to raise awareness of Viral Myocarditis and to promote good health and eating habits, as well as the importance of living a healthy and happy lifestyle. I continue to need to stay connected to my memories of Logan, no matter how painful it seems at that moment. Sharing stories of Logan with my husband, my family and my friends gets me through the pain. Crying is my connection to Logan. My love for him grows with every good cry. I find I am renewed, and I know that my continued strength comes from him. I have also found peace, peace in the precious eyes of my other children. They are proof that love never dies and that life does go on. I hope Logan is looking down on us with a “huge heart” at all that we have done, and continue to do, to keep his memory and love alive. I miss him more than words can say. I think about him every day, and I know that he will be forever in our hearts. I love you, Logan. This story is heartbreaking and one can hardly imagine the pain this mother and Logan’s family has gone through. However, there determination to remember Logan and to continue his legacy is truly inspiring! This story is heartbreaking and one can hardly imagine the pain this mother and Logan’s family has gone through. However, their determination to remember Logan and to continue his legacy is truly inspiring!